“Global Britain” and the Future of the British Armed Forces argues that as the geopolitical situation in Europe and beyond becomes more unstable, the United Kingdom must commit to increase its military budget to approximately 3% of Gross Domestic Product over the next five years. With higher spending, the UK could continue to deter threats to the security of its European allies or prevent them from coming together in inappropriate ways. Meanwhile, to make a success of “Global Britain”, both from an economic and political standpoint, the nation must engage more actively than ever in the Indo-Pacific region. With the decision to leave the European Union and the emergence of an American president who wants his allies to pull their weight, this report outlines clearly why the time is hardly right for the government to consider further cuts to our armed forces. Britain needs to engage more in Europe and more in the booming Indo-Pacific region. This requires a strong army, a capable air force and a go-anywhere navy. As well as offering insightful analysis of the UK’s past role in both European and global security, this report raises a number of urgent questions: what the UK’s future role should be; what our strategy for fulfilling that role is; and whether or not we are prepared to resource it. Despite recent evidence overwhelmingly demonstrating that the UK’s Security is now at greater risk than at any time since the darkest days of the Cold War, the UK government is still failing to offer a coherent strategy as to how we mitigate those risks. Instead it is overseeing an unwarranted and ill-advised decline in the UK’s defence budget and an unprecedented ‘hollowing out’ of our armed forces. Current government policies are placing the UK at risk, and the concerns that this report raises about the funding of our armed forces need to be urgently addressed. Britain’s amphibious capability, a crucial part of which are the assault ships HMS Albion and HMS Bulwark, is critical to the nation’s ability to deter challenges in the European littorals of the Wider North and the Mediterranean, as well as theatre entry worldwide. This report shows why the time has come to increase the resources allocated to defence to maintain them. As the world becomes more volatile, defence spending should not remain static. It is time for it to go up. This report explains why. This report argues that while Britain is a European power, it will increasingly be drawn into the Indo-Pacific region, where the future of the global economy rests. The country therefore needs the ability to continue to underwrite European security, while simultaneously forming closer relations with countries East of Suez. Enhanced defence spending is key to this. 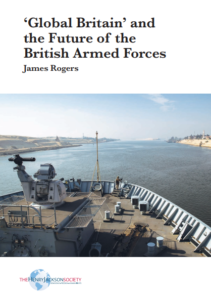 I believe this report outlines – using geopolitical analysis – why the United Kingdom, as it leaves the European Union, must take military power more seriously. It shows why Britain, with a deepening commitment to its European partners, the emergence of a revisionist Russia, and growing interests in the Indo-Pacific zone, needs to spend more on its armed forces. To read the full policy paper, click here.